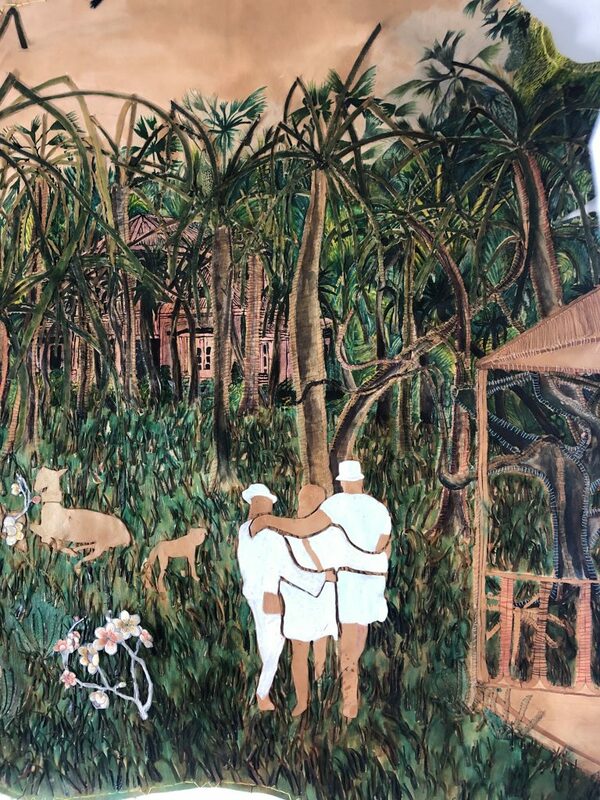 Moses Quiquine is a 22-year-old artist of Guadeloupian ancestry. 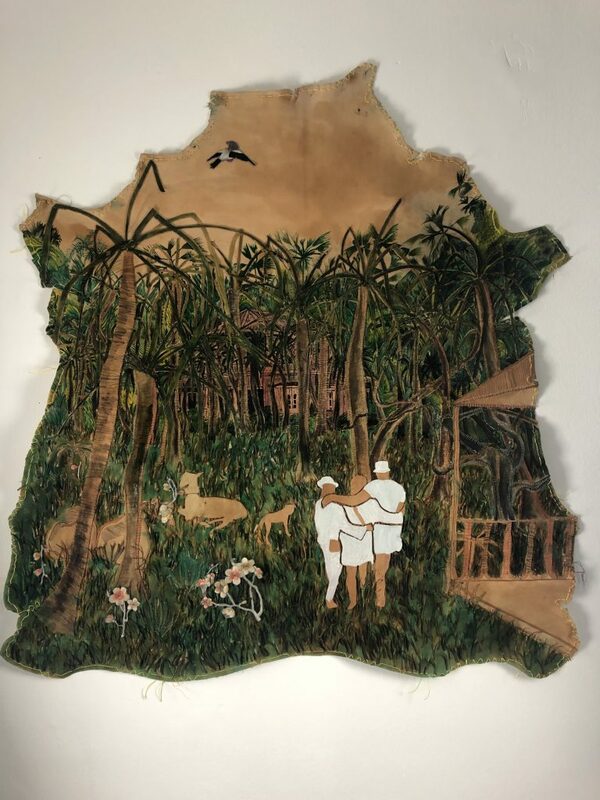 His latest body of work was made in response to his visit to sacred voodoo sites and shrines on the French Caribbean island of Guadeloupe. Voodoo or Vodou, the Creole spelling of an African word for spirit, originated in Haiti, West Indies, during the French colonial era. It was brought there by African slaves in the 17th century, and subsequently became mixed with elements of Catholicism. Voodoo helped to unify the slaves who in 1791 rebelled against their masters and went on to create the world’s first black republic. Nowadays Voodoo is a living religion that is a widely practised in Haiti and other parts of the Caribbean including Guadeloupe. There is a popular fallacy that voodoo is linked to evil and black magic rituals that involve sticking pins in dolls to harm others. It is therefore important to challenge these negative misconceptions of Voodoo that provoke fear of any art associated with it. 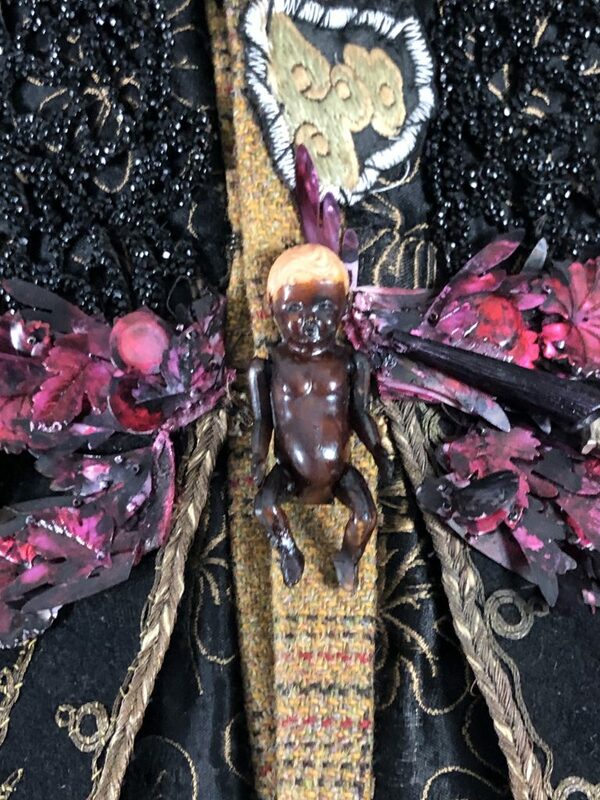 Quiquine’s was born in London in 1996 of French Caribbean descent, and his practice involves a complex multi-media reconfiguration of couture and fashion skills together with found objects that relates to the syncretic symbolism inherent in the sacred art of voodoo. He is interested in the emotional engagement and tension involved in transforming, juxtaposing and contrasting devalued and discarded materials to explore the themes of ritual, identity, representation and mysticism in relation to black aesthetics. The exhibition shares its title with Jimi Hendrix’s famous song Voodoo Chile (Child) recorded on the 1968 album ‘Electric Ladyland’ and Quiquine is much inspired both by his innovative music and flamboyant dress sense. Yet Quiquine’s use of the title embodies both the ideas of reconciliation of disparate parts and the sacredness of this process. 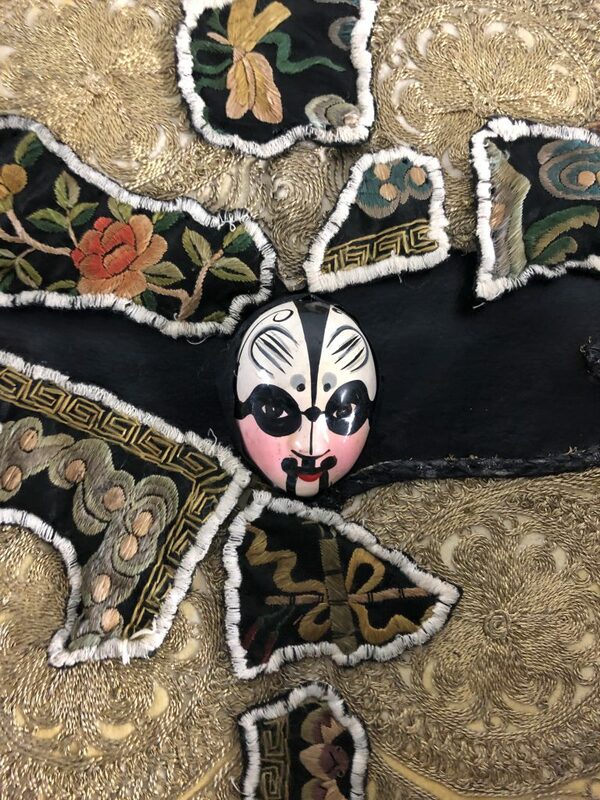 The new body of work includes a series of meticulously executed and densely variegated textile sculptures and two-dimensional works rendered on cow and goat hides. Some artists also use clothing in sculptural tableaux, notably Yinka Shonibare whose suits and dresses are exquisitely fashioned in African style batik prints. His garments on headless mannequins are charged with overtly political messages of identity, class and race while in contrast Quiquine’s art is more about being playful and unrestricted with imaginative resonances of Caribbean culture. His work makes evident the notion that art and fashion as distinct practices are becoming increasingly blurred. The philosopher Roland Barthes, in his influential publication ‘The Fashion System’ (1967), argued that fashion is not about function but more like a symbolic language. In this way fashion could be regarded as a means of communication just like art. The fashion/art fusion had a precedent when Andy Warhol collaborated with Yves Saint Laurent in 1974 and major art institutions now host exhibitions by famous fashion designers and fashion houses like Prada have created their own art foundations. Fashion brands such as Louis Vuitton now sponsor art exhibitions and have collaborated with artists like Jeff Koons and Takashi Murakami. Parallels can also be made between fashion shows and performance art like the striking photographs and tableaux vivants of Vanessa Beecroft. 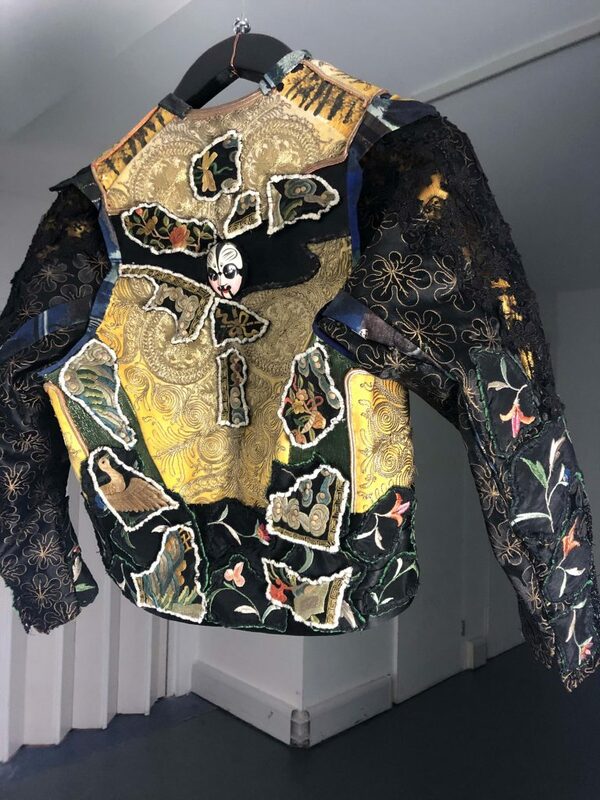 Quiquine’s practice not only relates to this fascinating relationship between fashion and art but also blurs the boundaries between fine art and craft through his textile works that are effectively mixed media sculpture. 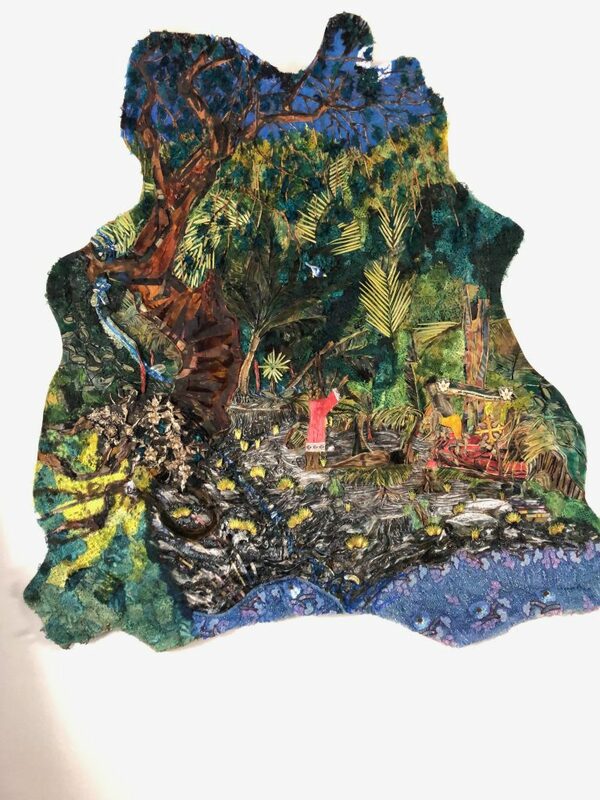 It is part of a wider movement among young emerging artists whose work includes hand stitched pictures, tapestries, and ‘sculptural clothing’. Beyond the confines of traditional fine art media, this work forms a fresh and dramatic contrast to the hyper-ironic, conceptual, intellectualised focus of much mainstream contemporary art. It also coincides with an increasing new appreciation for folk art and self-taught art, the so-called ‘Outsider Art’ – a loose term for work by people without traditional art school training. Quiquine’s work is about disregarding existing artistic boundaries and classifications, while combining a level of craftsmanship with a rich visual narrative. It celebrates the process of making and helps to redefine the relationship between visual art, fashion, handcraft and performance. This entry was posted in Art Reviews., EXHIBITIONS and tagged Moses Quiquine. Bookmark the permalink.